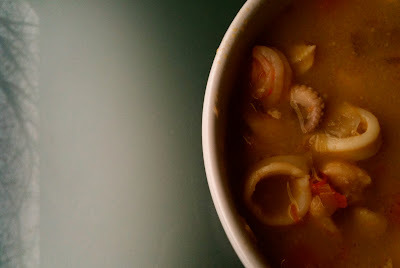 Las hambres: Fish Soup "Sopa de Marisco"
Heat the oil in a saucepan and fry the garlic on a medium fire for a minute. Add the capsicum and the onion, fry for 5 minutes. Add the rest of the vegetables and slowly fry on a low fire for around 20 minutes. Add the thickener and stir for a minute. Then add the Fish and Crayfish, stir, pour the wine and Brandy, stir and cook for 5 minutes. Now we add our wonderful fish stock or caldo followed by the seasoning. You can optionally add some "Picatostes" (croutons) or boiled rice.